Outer Aylesbury Ring – Neil Baldwin's blog : Warning contains walking, technology, photography, holidays. My Sunday was free so I thought I would fit a walk in. I had previously looked at the Outer Aylesbury Ring but could not see a way to easily do 12 ish miles especially with Sunday public transport, however another look at the OS on line maps and I had realised the route from Princes Risborough to Aston Clinton was 12 miles, and a bus at 09:09 and train would get me there before 10:00. A plan was hatched! I was early for the bus but not with enough time to pop home and get some headphones which I had forgotten, much to my annoyance. The bus stopped outside the station and my ticket to Princes Risborough was only £2.80 on a railcard. Coffee and Snickers were procured but I almost ended up on the wrong train when I boarded the one on platform 3 instead of the correct one on 2. I had a minute to spare. I had planned a route from the station but did not follow intended route but used a more interesting gated road. I tried in the high street ti get some earphones but failed. It was a long hard slog to get out of Princes Risborough and on to the top of the hill. Steps had been built in the upper parts and they seemed to go on for ever. I welcomed the rest at the top whilst chatting to an old boy who had walked up to listen to aircraft traffic on his scanner. The view from Whiteleaf was stunning as there was little haze. The path then dropped down into Cadsden where the Plough pub/restaurant was not quite open for a coffee, and it was a bit early to be stopping for a coffee break. 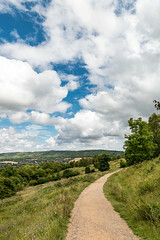 The path then goes up again then across a hill where you can get views of Chequers. The route from there to Edlesborough takes you through an unusual natural Box Hedge, which extends across the whole of the valley. A coffee would have been good but it was the wrong Sunday at Edlesborough church, so I headed off towards Bacombe Hill, where I encountered the steepest hill of the day. On my way up I pass a group of families coming down. I was not sure if it was easier going up or coming down as the path was a bit slippery from the recent rain. At the top the rain started so the poncho came out again, until I was at the monument, where I rested and took a timelapse sequence, which turned out to be shaky because of the stiff wind. I had made a point of steadying the camera. Down in Wendover I stopped for a sandwich and a coffee at what I call Two Poundland but which is actually called No 2 Pound Street. I took my time as it started to rain and I was on no rush to get started again. I chose to walk around the edge of Halton and ended up walking through a new estate there. It seemed like a great place to live really close to Wendover woods and quiet. I headed across the road and down to Harebridge lane then around the end of Halton Airfield, where I saw a glider land. Then it was through Aston Clinton park and home. It was a god 12 mile walk with no complaints from my back things were looking up. I felt confident enough about my back to attempt a 12 mile walk, after a couple of weekends ramping up the mileage. I considered the next stretch of the Ridgeway but decided a local walk would allow for an easy rescue if I needed it. I arranged a very much appreciated lift to Wing with Helen’s dad. He dropped me off at 10:00 at the edge of Wing where I picked up the OAR path, heading towards Mentmore. It was easy going to start with the path going slightly down hill, a short up action dumped me out on the last hundred yards of the road to Mentmore, where I stopped for a rest on a bench, and consumed my Snickers for the day. The path is well sign posted with the OAR logo however it is small and nearly always stuck or nailed to another sign so you have to look carefully. From Mentmore it was again down hill to the railway, which is great train robbery country, however the path does not pass the famous bridge which is a Mike down the track from where the path crosses. Soon after the railway the path hits the Grand Union and stays on it for the rest of the days section, which ends up in Aston Clinton on the disused Wendover arm. I would finish the section at Stablebridge. I passed a few sights of a note a lady duck a and some Ducklings who were surprisingly trusting, and some barnacle geese which were too. There were some signs about dredging along the way and a I noticed some bits of metal at the side of a the towpath on occasions, most of it of little interest, however I did come a cross a cigarette machine near a bridge, which was open. It was full of mussel shells presumably emptied by birds. At about mile 6 I found a bench at a lock keepers cottage to rest and eat my sandwiches, Red Leicester in wholemeal Babs left over from our veggie burgers the night before. At Marsworth the path leaves the canal to take a detour though the village, only to join it again at the reservoirs. I stopped for coffee and cake at the Bluebell tearooms where the queue of two took some time while a spotty teenager was trained on the till. I sat outside and ate my chocolate cake which had spent to long on the cooler, the sparrows were not so bothered and wolfed down the crumbs I offered. I tried to get them to eat out of my hand but they would only get with 12 inches. Between Startops and Wilstone reservoirs there were quite a few groups of Duke of Edinburgh kids with large packs. The renovation of the Wendover arm was a bit further forward than the last time I was around. It is taking quite a while I suspect that without more funding it will be quite a few decades before it is finished. I rested for 10 minutes on a convenient bench at the point where the renovation stopped then finished off the section.